Last week, my family had a "weekend family Christmas shopping date" on a Friday - which is also my wet market day. However, since we came home so late, I didn't get to do my "wet market grocery" which made our next day's lunch nada! And you know the drill when that happens right?! But no, I did not consider buying a de lata for our lunch. Instead, I've been thinking of having our food delivered. However, I don't have a telephone here and using a cellphone isn't such a smart idea. Luckily, Mommybloggersphilippines.com has given me an opportunity to try one of their blog partner which is an online food delivery. And I was like "why not do it NOW?!" Then that's the time I checked FoodPanda.ph - an online food delivery portal with more than 160 restaurants to choose from! 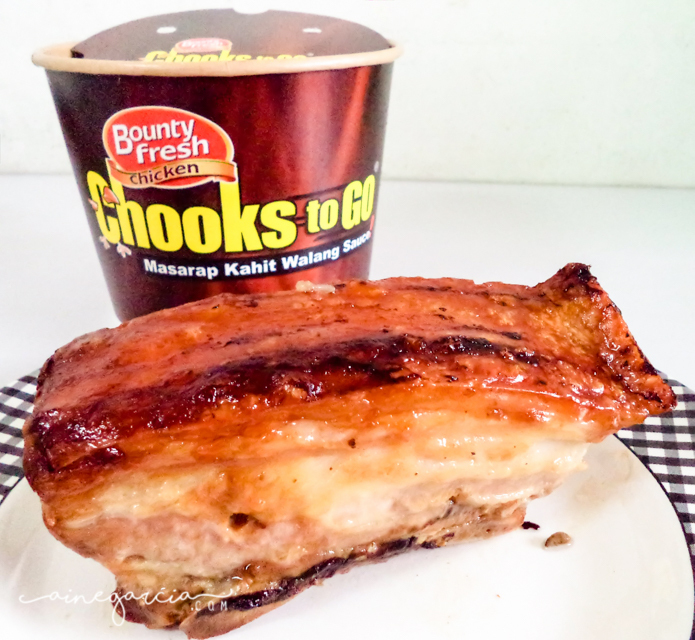 And so, after a not-even-over 30 minutes, I got my Chooks-to-Go Juicy Liempo! That was actually fast since I was given a 55-minute delivery time. So, that was a plus! And that only means that FoodPanda's online food delivery service is indeed working! And because I am perfectly satisfied with their service, I would be glad to give you a peek at how FoodPanda works. 1. Create your own account using your email address. 2. Enter your city and location to search for restaurants and other food establishments around your area. 3. Choose the restaurant you'd like to order with and scan through their menu. 4. Add to cart, finalize your order and proceed to checkout. 5. Review your order, choose your type of delivery and time. Enter your voucher code if you have one to get discount on your transaction. Review Your Order sectionThis is where you can choose the option of Delivery or Pick up, and whether you'd like it to be delivered right away or at a later time. This is also the section where you can enter your voucher code. However, not all restaurants accept vouchers. 6. Enter all necessary details needed - delivery address, payment option. Then click on that green "Place Order Now" button. This is where you'll provide your correct and complete delivery address, as well as your special delivery instruction. This is where you'll get to choose how you will pay your food. Payment options include: (1) Online payment via Visa or MasterCard, (2) PayPal payment, not sure though if they have an additional fee for that, and (3) COD or Cash on Delivery, my preferred mode of payment. Now payment option still varies in other restaurants, some would only require online payment, while others are on COD only. I'm so happy I discovered this type of service and finally realize that food delivery will always be every housewife and full-time mom's hero. I don't need to put some makeup on, go out of the house, and suffer the endless traffic just to buy food. Thankfully, FoodPanda.ph took food delivery to the next level, because I can do it online - even if I still have messy hair, FoodPanda wouldn't mind. Lol! And because of that, FoodPanda will be my new "knight-in-shining-armor" and my "food rescuer online" thus making my mommy life as easy as 123! With all the convenience of online food delivery, I could spend that extra time with my daughter while waiting for the food to be delivered. I really like FoodPanda, especially NOW. Why? Well aside from their easy-to-use website interface or shall I say their user-friendly site, and of course their fast and reliable service, they also offer great deals and discounts on their chosen restaurants. AND, surprise! Surprise! When I was checking their site yesterday, they already had two of my most favorite - Greenwich and Pancake House! It was so amazing, because the first time I used FoodPanda.ph 2-weeks ago, I was really hoping they will add more restaurants to their portal. And as FoodPanda continuously grow their family, I know for sure they would be able to get MORE restaurants to join them! Perhaps, cater ALL restaurants and food establishments. Hope you enjoy my MERRY FoodPanda experience. And hopefully, let FoodPanda be your food rescuer online as well!